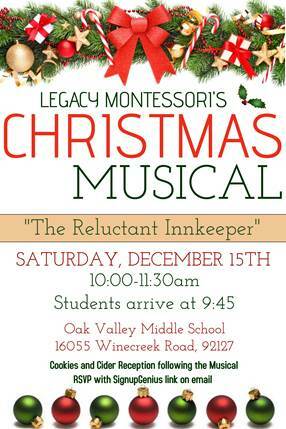 We are pleased to invite you to our annual Christmas Celebration on Saturday, December 15th from 10:00-11:30am. We are looking forward to celebrating the birth of our Savior, Jesus. Students arrive at 9:45am for line-up. Pre-Primary and Primary Student Attire: Red top/dress with dark pants/skirt. RSVP: by Wednesday, December 12 by clickinghere. Help Needed: Set-up and Clean-up. Please indicate your preference on your RSVP.